Yes, the DHS wants mug shots of all air travelers | Papers, Please! Yes, the DHS wants mug shots of all air travelers – Papers, Please! Achieving full operating capability for the biometric program by 2021 may be contingent upon airports and airlines purchasing the digital cameras needed to take passenger photos at boarding gates. However, the… pilot was not effective in securing commercial stakeholder funding. Three airlines conducted pilots independently while five others helped CBP test biometric capabilities at airports; however, by the end of our audit work in January 2018, none had agreed to provide funding or staff to support the biometric program for the long-term. Airline personnel we interviewed voiced apprehension about providing funding support for a government-run program. Additionally, multiple officials from a commercial airline advocacy group stated that DHS, not the airlines, was mandated to implement the biometric exit capability. These officials did not agree that airlines should be responsible for purchasing cameras and capturing photographs to support biometric processing. 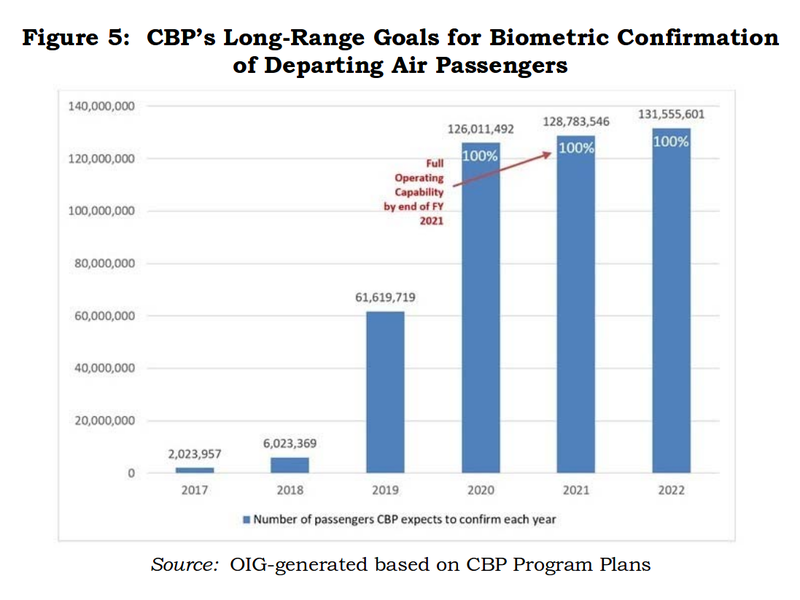 CBP’s plans to rely upon airport stakeholders for equipment purchases pose a significant point of failure for the Biometric Entry-Exit Program. Program…. In March 2018, program personnel planned to mitigate this risk by conducting stakeholder outreach to promote airline/airport participation. They also anticipated offering incentives, such as facial recognition processing in place of boarding passes, to enhance the travelers’ experience. 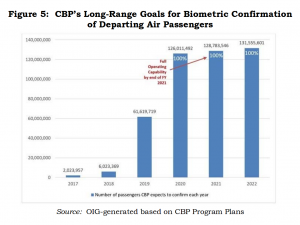 Biometric program officials recognized that CBP would not have an adequate number of personnel to achieve full operating capability at 20 airports nationwide by 2021 if the airlines did not agree to provide staff support. As such, the program’s September 2017 cost estimate and staffing plan assumed that for the long term, the airlines alone would operate cameras and take passenger photos…. CBP would have no staff resources of its own available to conduct biometric processing for departing passengers. [P]ilot operations did not reflect CBP’s planned approach of relying on airlines to conduct biometric processing. We’ve seen exactly this dispute between government and industry before, 10-15 years ago, when the DHS and its international allies began demanding that airlines collect biographic identification data about travelers, for use by the government. We heard airlines tell government officials, publicly and explicitly, that they would be happy to collect data about travelers and pass it on to governments, as long as (1) governments bore the cost, and (2) airlines were allowed to retain and use data collected under government mandate for their own business purposes, without restriction. In the event, the airline industry had to absorb several billion dollars in expenses to modify their IT systems to collect, store, normalize, and transmit biographic identification data (API, Secure Flight Passenger Data, and PNR data) to government agencies. But airlines succeeeded in being allowed a free ride to retain and use this data for their own purposes, without limitation. And to minimize the burden on airlines (at the expense of maximizing the burden on travelers’ rights to freedom of movement and freedom from unreasonable searches and seizures of informational property), the government set up root-privileged links to acquire airline reservations in their entirety, including data provided or collected for commercial purposes but in which governments have no conceivable legitimate interest. Airline, travel agency, and airport staff can enter unverified derogatory free-text remarks in a Passenger Name Record that will be imported directly into the lifetime DHS travel history file for the passenger in the Automated Targeting System (ATS-P). The call center agent who enters a note in a PNR informing colleagues about a customer service dispute may not even realize that their remarks will be used as the basis for precrime “risk assessments” and may result in algorithmic blacklisting of the traveler by the US or foreign governments, without redress. Now we are seeing exactly this same dispute over cost and data sharing repeated with respect to biometric identification data. 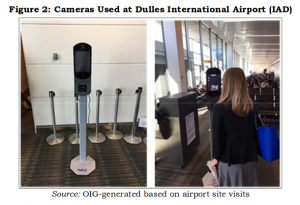 The outcome, we expect, will be the same: Airlines and airports will have to pay for camera infrastructure and some staff, but will get to retain and use the mug shots to which travelers will be required by the government to submit. Negotiations between DHS and the airline industry over biometric data collection and use continue as we write. Today in Athens, for example, the Deputy Administrator of the TSA is appearing on a panel on “flow management of passengers” at a global airline industry symposium. Undoubtedly she’ll be pitching her airline audience on the business case for “partnering” with the DHS to collect biometric data that they can use for business process automation and personalization while government agencies use it for surveillance and control. A win/win outcome for airlines and governments, a lose/lose for travelers and human rights. Pingback: Smile, travelers! You’re on candid DHS cameras. | Papers, Please!